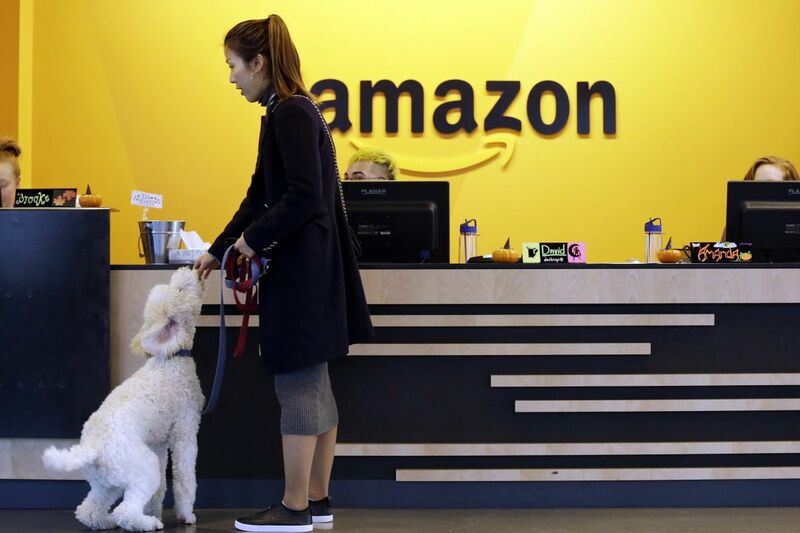 In this Wednesday, Oct. 11, 2017, file photo, an Amazon employee gives her dog a biscuit as the pair head into a company building, where dogs are welcome, in Seattle. Tennessee officials have also embraced Amazon’s plans to bring 5,000 jobs to Nashville, which this week approved $15.2 million in road, sewer, and other improvements related to that project. Amazon executives have had internal discussions recently to assess the situation in New York and explore alternatives, said the two people, who spoke on the condition of anonymity so they could candidly discuss the company’s perspective. Key officials, including freshman U.S. Rep. Alexandria Ocasio-Cortez (D., N.Y.), whose district borders the proposed Amazon site, have rallied against the project. And opponents went door-to-door to warn people in Queens of looming rent hikes and displacement, much as Seattle experienced during the company’s explosive growth there. New York state and city officials have played down the chances that the deal will fall through. They pointed to opinion polls showing strong public support for the project, and said Cuomo and de Blasio will fight hard for it. But the resistance is well organized and energetic, based in unions and community groups. In addition to Ocasio-Cortez, opponents include City Council Speaker Corey Johnson, Deputy Leader of the City Council James Van Bramer, and State Sen. Michael Gianaris, who is deputy majority leader in the Senate. New York is a pro-labor city, whereas Virginia is a “right-to-work” state where employees cannot be obliged to join a union as a condition of employment. New York also is straining from the effects of rapid economic growth, whereas Arlington is eager to attract investment to its Crystal City area to offset the loss of thousands of federal government jobs there in a Pentagon reorganization that began in 2005. The activists have occupied an Amazon store in Manhattan, marched in Albany, and demonstrated at the office of Assemblywoman Catherine T. Nolan, who supports the deal. “Most people think this is a great opportunity,” Board Chair Christian Dorsey said. The board is pressuring Amazon to sign a project labor agreement that ensures a living wage, proper job classifications, and safety standards for all those employed by construction contractors and subcontractors.